We start every visit with a full check of your car. We go over the entire vehicle from bumper to bumper, checking all safety and maintenance needs. 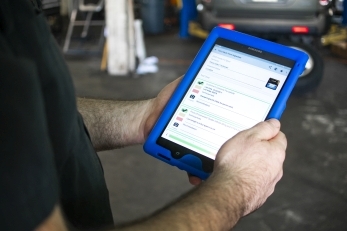 See your vehicle through the eyes of our experts mechanics when we text an interactive report straight to your phone! Scroll through our comprehensive digital inspection right in the palm of your hands. The report is complete with pictures, descriptions and a rating system that helps you know what is a priority to fix and what can wait. With our inspection, you can make an educated decision about repairing and maintaining your vehicle. After reviewing the inspection report, give us a call and we will give you a fully itemized estimate on the repairs and maintenance we recommend. Our inspections are stored in our database, making it easy to track the wear of standard maintenance items and allows us to predict what your vehicle will need in the near future. The ability to monitor your vehicle's progress makes our inspections an invaluable part of the service we provide. Inspections are free with any service! Click here to see an example!